For the twenty anniversary of the beginning of the Kinship Wars the Finnish Union of the Kinship Warriors made a decision to institute the Kinship Wars Commemorative Cross. Kinship Wars Commemorative Cross was a mark of honour which was awarded to both Finnish liberators of related Finno-Ugric peoples and their brothers in arms from these Finno-Ugric peoples in the Estonian War of Independence, in the expedition to the Lapland Kola, in the White Sea, Olonets and Ingrian liberation battles and in the other Kinship campaigns, as well as those who honourably involved in their organization. 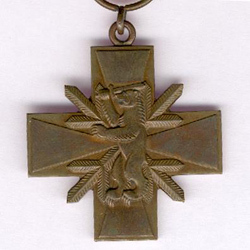 A sketch of a bronze memorial cross was made by the leader of the Finnish Union of the Kinship Warriors Jäger Lieutenant Colonel Eero Kuussaari. 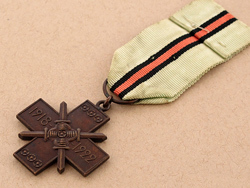 On the reverse side of the cross are set the years of the beginning and end of the period of the Kinship Wars (1918-1922) and the six rosettes which illustrate the six main directions of these wars – Estonia, Ingria, Olonets, White Sea, South Kola and Petsamo. The ribbon have the Karelian colours: red, black and green. The number of swords on the ribbon indicate the number of campaigns (expeditions) where the person has participated. 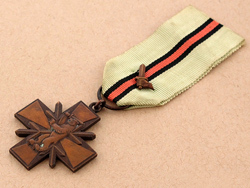 Crosses were awarded on the basis of requests which contained the evidence of involvement in the Kinship Wars. 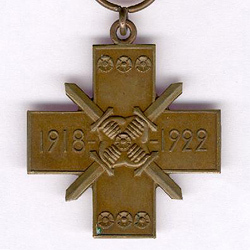 Commemorative Crosses were also granted to the lived in Finland or in Estonia Ingrian Finns and Eastern Karelians, which participated in the battles of the Kinship Wars and were not able got the Olonets Commemorative Medal and the Karelian Commemorative Medal because they were not Finnish citizens. In the same 1938 year, the President of the Republic of Finland Kyösti Kallio confirmed that the cross can be worn on the military uniform of the country's Defence Forces.